The NBC Nightly News is an American institution that has been broadcast nightly in its current format since August 1, 1970. Arguably, the Nightly News, alongside newspapers, has served as America's primary source of information dissemination over the past 50 years. Over this time, changes in technology, visual culture, and the market dynamics for news shows have led certain aspects of nightly news production to evolve in subtle ways. The N^3 Report presents a meta-broadcast of the NBC Nightly News (1980-2008) unpacked by cultural analytics. Through techniques examining visual characteristics and technological shifts that both are and are not obvious to the human eye, the N^3 Report performs what could be called "producer measurement systems"* in search of visual patterns, trends, or variations and asks what defines the "look" of the news institution over the past 50 years. How and when did aesthetic changes take place? And what might be the "look" of the future? 1) An increase in intensity and brightness by year. 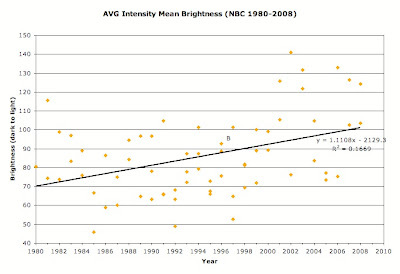 AVG Intensity Mean Brightness (NBC 1980-2008): This graph presents the average measurement of brightness for all shots in each of the NBC Nightly News segments measured. The data reveals a trend of increasing brightness over time. 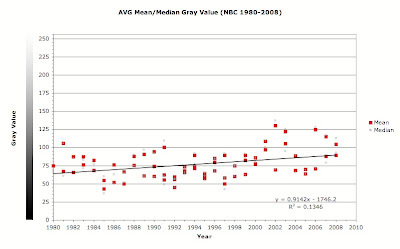 AVG Mean/Median Gray Value (NBC 1980-2008); An average composite image, which essentially merges the moving images footage into a single frame, was created for each of the introductory segments from NBC Nightly News episodes ranging from 1980 to 2008. This graph presents the mean and median gray values in these composite images. The data indicates an increase in average brightness (on a 0-255 scale) over time. 2) A graphic inundation throughout the nineties and into the millennium that appears to have subsided in the last two years in favor of a renewed and stable focus on the anchor. Each image in this visualization is created by adding all frames in a given news video on top of each other. Each image on the top row represents one year of the 1980s, the middle row corresponds to the 1990s, and the bottom the 2000s. Note how in the middle of the 1990s row, the visage of the anchorman is replaced by an image dominated by graphics and motion. The focus on the anchorman returns in 2007 and 2008. 3) A visualization of temporal patterns using montages of segmented frames. 4) A high speed video montage of NBC Nightly News introductions over the past 30 years. Our investigation explores potential correlations, which may then be further developed through further research. The goal of this project was to take a mainstream source of information, the NBC Nightly News, and analyze the aesthetic techniques used in tandem with the message and reputation that is attached to this specific news program. It is also useful for viewing cultural shifts in the news over time. We focused on introductions to the Nightly News broadcasts because of the relative level of producer control and the concise presentation of what is to follow. By using visualizations of the visual aspects of introductory segments from 1980-2008, we hope to broaden the understanding of this cultural mainstay in American culture and open new questions that, without such techniques, may be overlooked or not realized, but that could contribute greatly to the growth of visual humanities and cultural studies.